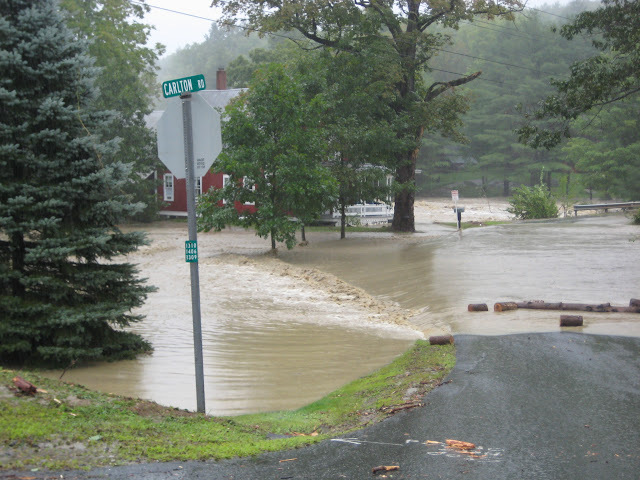 It’s been a waterlogged week here in Cavendish, VT. Here are some pictures of the areas around our house, where we are on day 4 of no power or water. We’ve managed to find internet and hot coffee at a small restaurant in Ludlow where we are currently camped out for the afternoon with everyone else who needs an internet fix. A house and part of the street on the corner of 131 and Whitesville, Sunday afternoon. Damage to 131 near Whitesville Rd. due to the flooding and debris. This woman's house is between this damage, and the damage on a further portion of 131, she walked to the store and had to climb down into that broken road to get home. This is Davis Road, about 1/4 mile from our house. 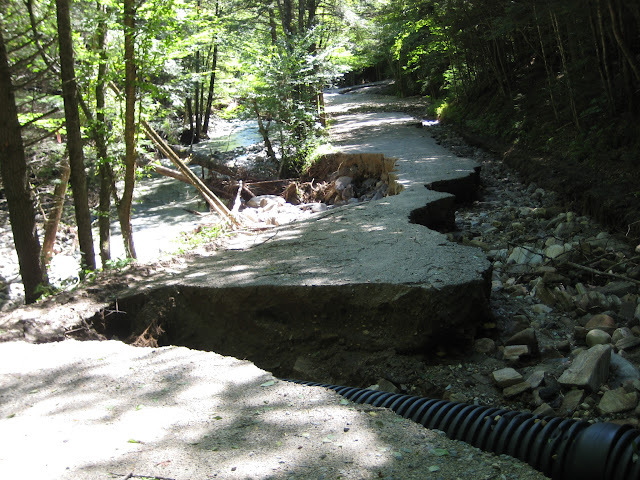 The road has literally been swept completely away by the water. Near the flat rocks off Davis Road where we used to swim as children. Again, the road is completely gone. This is about a mile from our house on Brook Road, it's usually an alternate route out to Route 131, but no more. 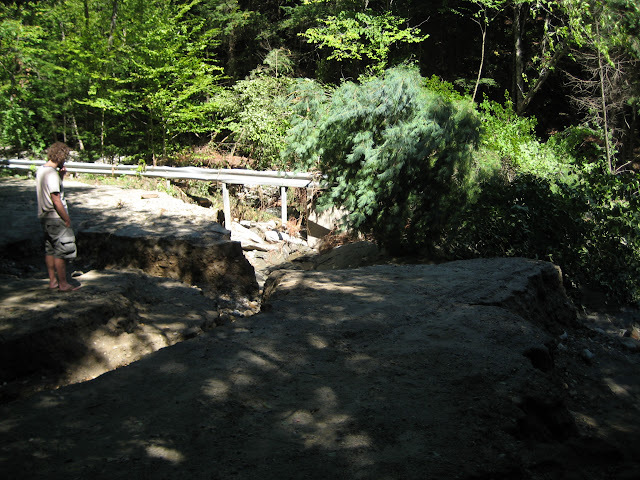 We got past the first chunk of damage on Brook Road on foot, and then came to this, which we couldn't cross, even on foot. The former parking lot for the Crow's Corner Bakery, and surrounding buildings, in Proctorsville. The owners live down the road from us in one of the stretches of road that's been totally destroyed. House next to bakery. We talked to these people who told us their insurance won't cover the damage because they don't have flood insurance. We suspect that will be the case with many people who suffered damage. We are fortunate to not have sustained any damage to our home, but that is not the case for many thousands of others. The Red Cross has a station set up for food and water, and we’ve seen the local firemen as well as the army (or national guard perhaps? ) delivering water and food on their 4-wheelers to people who are stranded. 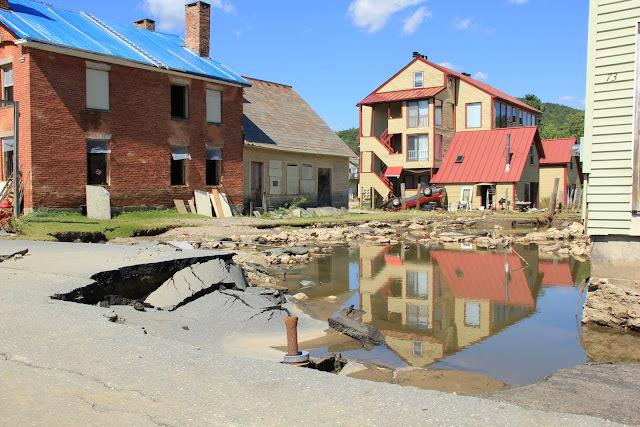 We hear there is similar damage in other parts of rural New England, not to mention all the flooding along the rest of the coast, though we haven’t been able to get any real news since we’ve got no power. 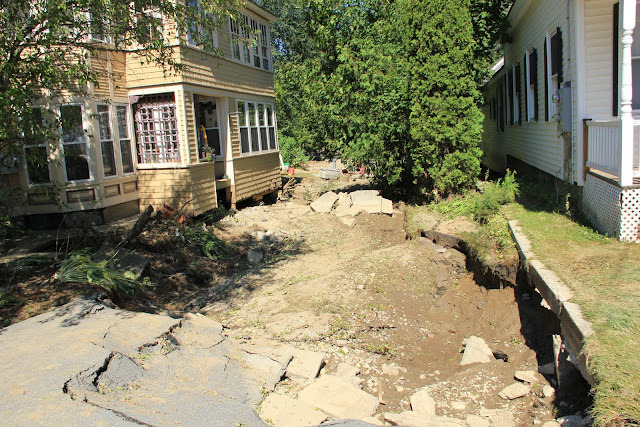 We though we were too far inland to sustain any real damage from Irene, but clearly we were mistaken.